Bring a large saucepan of water to the boil, add the tagliatelle and cook for 10 minutes until just tender. Meanwhile, heat the oil in a large frying pan and add the courgettes in a single layer. Cook on a medium to high heat for 5 minutes until golden, turning to cook both sides. Add the garlic and chilli and cook for a further minute. Season the courgettes and stir in the grated lemon zest. 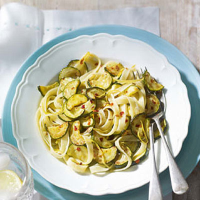 Drain the pasta and toss with the courgettes and any oil from the pan. Check seasoning and serve with grated strong vegetarian Cheddar or Parmigiano Reggiano if desired.